The Endphase [“Final Phase”] project was born as an initiative of the composers Alberto C. Bernal, João Pais and Johannes Kreidler (replaced by Enrique Tomás in early 2008). The search for a musical environment where many presumptions of traditional composition could be transcended — quantification of musical ideas due to their fixation in paper, individuality of the composition, separation between composition and performance, dependence on the traditional instrumental techniques… —, gave the initial impetus for the project in 2003. Since then, the trio has performed regularly in several countries (Germany, Netherlands, China, Hungary, Portugal and Spain), giving workshops and presentations about its æsthetic and technical approaches, and always trying to keep a fresh and personal way to conceive and develop music which tries to connect the out-of-time character of written composition with the open possibilities of performance in real time. Beginning with the formation of the group, this article will deal with the main issues of the Endphase project, describe the preparation work involved in a performance in both æsthetical and technical levels, and finally, notate some characteristics that we think are important for the individuality of the project. Figure 1. Endphase performing in Darmstadt. Kunsthalle Darmstadt, Internationale Ferienkurse für Neue Musik 18 August 2004. In 2003, composers Alberto C. Bernal, Johannes Kreidler and João Pais were in the middle of their composition studies with Mathias Spahlinger in the Music Conservatory of the German city of Freiburg. This fact alone could already say something about the compositional interests and preoccupations we have in common. Spahlinger is, both as a composer and as a teacher, a personality known for his critical position in regards to musical convention and for his ongoing search beyond the borders of tradition. Naturally, many student-composers who share these ideas are attracted to his classes, and his pedagogical methods are very helpful in forming a critical mind in the student. We attended a number of Spahlinger’s seminars while at the Conservatory, which covered a range of topics such as conceptual music, music and speech, new music improvisation, and Fluxus, as well as benefiting from several guest seminars by, for example, Bernd Konrad (collective improvisation) and John Tchicai (free jazz), where we gained valuable experience playing together and with other musicians. We all were also very active in the conservatory’s electronic music studio, directed at the time by Mesías Maiguashca, always trying to discover new potentialities that the electroacoustic medium could offer us. At one point or another, all three of us were studio assistants, which provided an opportunity to develop a deeper and continuous contact with the technical equipment. We also gained important practical experience in the programming and performance aspects of electronic music, as we were responsible for the supervision and assistance of projects by other students using the studio. Despite having somewhat similar academic backgrounds and interests in terms of æsthetic concerns or technical know-how, each of us had — and continues to have — a highly individual approach to music composition. Further, specific aspects of our backgrounds have had a determined influence on the Endphase project. For example, the music of João Pais typically features a microscopic richness of detail and has a more “materialistic” profile, while Alberto C. Bernal’s work is concentrated on the macro-topography, and he will sometimes find it necessary to renounce intervention in the realm of the smaller details in order to assure conceptual transparency. While the music of Pais and Bernal could sometimes be broad, may unfold over a longer period of time and/or be quite sparse, Johannes Kreidler’s output is almost always highly energetic and pointillist in its discourse. While Kreidler and Bernal tend to reuse musical or non-musical materials as a basis for their musical pieces — samples, quotations, deconstructed musical gestures — Pais, although not exclusively, makes more use of neutral sound elements — materials without an accompanying “context” to which they have a clear link. The differences and similarities in the way we individually approach our main activity — composition — are very important to the Endphase project, as Endphase isn’t merely improvisation, but rather something between composition, improvisation and performance. They are also reflected in the compositional and conceptual approaches in the various performances we developed within this project. Our first experience playing together as a trio arose out of a curious situation: the composition class from the Conservatory was invited to present a live-electronic concert/project featuring their own works in Dettenhausen (Germany). A couple of pieces by other composers were cancelled only a few days before the concert, putting the realisation of the event at risk. At Kreidler’s suggestion, we spontaneously decided to fill in the time with a live-electronic improvisation. For this first event we performed on three acoustic instruments, which were amplified and lightly processed electronically, and a fourth “voice” consisted of randomly generated electronic material. Kreidler played a prepared violin, Pais a Gadulka (Bulgarian bowed string instrument), and Bernal a Flamenco Cajón. None of these instruments were our main instruments; in fact neither Bernal nor Pais had any previous experience with the instruments they used, which they borrowed the day before the concert. Because of the time restrictions, we only had a couple of hours to rehearse the day before the concert. The result was surprisingly good for the amount of rehearsals we had. Bernal recalls that he was more satisfied with the musical results than with the composed piece he had in the same concert, for which he employed about 1000 times more time than the improvisation. Of course it was not the proportion of rehearsal time to result that was so gratifying after this performance — in addition to our own individual preparations for an Endphase, we usually set aside many days of group rehearsal sessions for only a few minutes of performance. We had the impression that we had stumbled upon a really appropriate medium for our interests — not only material, but also human. It seemed to us that this medium could help us achieve specific æsthetic goals in a very efficient manner and would also allow us to create music that could never be written in a traditional manner (with time being sequentially fixed — in a score, on tape, etc. — for later performance at a later date). So we decided we would continue the initiative. Audio examples 1a and 1b: Excerpts of the trio’s first performance together. Bürgerhaus Dettenhausen, Germany, 9 November 2003. NB: Some of the audio examples in this article may sound quite dry, due to the fact that our recorded material is only the documentation of a live performance, and is by no means to be considered a produced electroacoustic piece. Between the Dettenhausen performance and the first event in which we presented ourselves as Endphase there was a gap of seven months. During that time we met several times a week to discuss our goals, develop the technical environment and rehearse. At that point we were not pressured by any impending performance obligation — we only scheduled the first performance after several months of rehearsals —, and were able to develop the project through a kind of trial and error process, exploring a number of different directions. Sometimes we planned out musical processes or situations, and then programmed the patches for it before playing through it several times. We recorded and listened to the rehearsals, discussing the general results, the positive aspects we could use and the negative ones we had to improve or simply discard. Other times we simply played freely, also recording the sequence and tried to understand why some ideas which were not pre-determined worked so well in order to use them in a determined manner and integrate them into the project. The technical set-up which we developed and used for the initial performances was very similar to that used in Dettenhausen, with Bernal adding a hi-hat and Pais substituting the Gadulka for an alto recorder. Again, all acoustic instruments were miked and independently live-processed. Because of how the instrtuments were played, the nature of the electronic processing and the balance between the electronic and acoustic components, almost no direct acoustic sound was perceptible, with the percussion being the only exception (for obvious acoustic reasons). There were also some autonomous computer-generated materials. 1) The beginning of two versions of the same musical idea, as rehearsed during this initial period. In this excerpt we tried to build up a confrontational discourse by justaposing contrasting material with a static tone. Audio examples 2a and 2b. Excerpts of Endphase 0.3a and Endphase 0.3b [NB low quality recordings]. Private performance in preparation for Endphase 1. Audio examples 3a and 3b. Excerpts of Endphase 1.5 and a rehearsal version of the same passage. Kleiner Kammermusik Saal, Musikhochschule Freiburg, 17 June 2004. In this case, the point of departure was a rhythmical pulse, interrupted now and then, over which several types of materials (more or less contrasting) were played. In both examples, we hear that there is always a sort of substructure of materials, ideas or approaches that remains constant through several versions and which gives a specific profile to the piece, while many of the minute details of each execution are completely different. In the rehearsals we concentrated on the realization of these details in view of articulating the substructure, and this is the realm in which we made qualitative judgements about the development of the project. This first performance consisted of five independent pieces, each one characterized by a very concrete musical idea or situation: confrontation with existing layers (cf. Audio ex. 2a and 2b), clear transitions of materials, densities vs. intensities, developing variations of several elements. These self-imposed limitations may contrast with the common idea of free improvisation, in which everything seems to be absolutely “free”, there is no formal plan or structure and no one is constrained by pre-defined concepts. It happens in many collective improvisations that form seems to be so free that it’s actually always the same — introduction, climax and fade out until the last person decides to stop playing — and æsthetic considerations are also so free that the same result emerges again and again: a situation without boundaries in which “anything goes”. The project is a convergence of the interests of three individuals — in the conception of the pieces as much as in their realization in a live performance — whose similarities and differences coalesce into the Endphase project; a very delicate balance exists between the æsthetic complicity which is necessary to conceive a well-defined musical discourse and the heterogeneity in the way these ideas are materialized. Within this delicate balance is where the identity of Endphase is found. This also explains why we have refused — since the beginning of the project — to do ad hoc projects with other musicians. The identity of the trio has always been intimitely connected with and strongly influenced by the musical and æsthetic evolution of its individual members (Johannes Kreidler in fact stepped down from the project after Endphase 13 because he had noted unresolvable æsthetic discrepancies between Endphase and his own recent work). It is precisely in this immediate relationship with “real” time that Endphase distinguishes itself from a compositional project, while the higher level of definition or resolution of the discourse and conceptual boundaries sets the project apart from generalized improvisation praxis. changes and modifications to ideas, or incorporation of new ones which emerge from the sessions. These and other approaches ensure that everything we consider necessary to be able to materialize the work in a real-time environment is in place. This materialization is the final phase of the overall process, the Endphase. Each musician had his own individual acoustic instrument and digital environment and both of these matured during the extended preparation time, as did the instrument-performer relationship. As a group, we intentionally chose contrasting acoustic instruments in order to allow for a broad sonic and gestural range. However, the electronics were always programmed independently by each performer, always keeping the common goals of the project in mind. The digital instruments developed by each individual performer must allow him to experiment and work with the materials and situations decided upon for the piece, and to explore the potential of his instrument in the most effective manner (some of these goals did in fact imply a specific technical means of realisation). None of the performers really knows (or needs to know) what the others have prepared in their patches and configuration, as can be understood by comparing two patches used in Endphase 1 (Figures 2a and 2b). 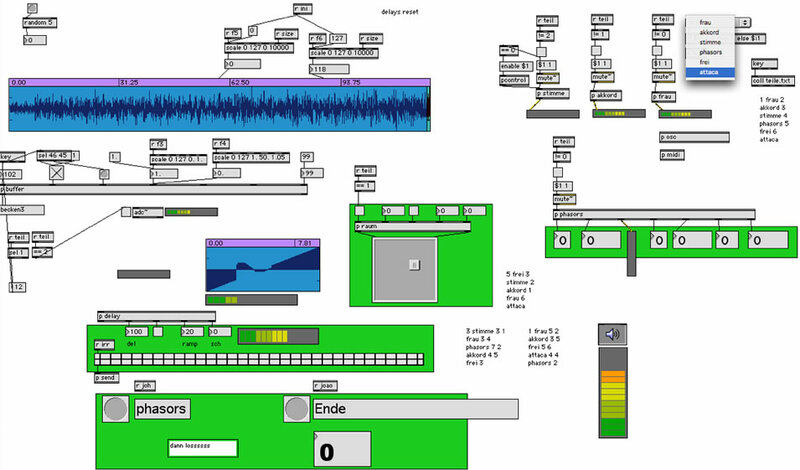 At this early stage, as we were using the hardware of the studio, all programming was done with Max/MSP, the official software of the studio at the time. Over the next three years, the group continued to work at the pace of around two to four presentations a year. A detailed description of all these events is well beyond the scope of this article, so we propose a general analysis of the path formed by these events, as well as of the various stages involved. It is pertinent to say that the experience prior to the first presentation was very important to all the Endphase projects that followed. By working regularly over such an extended period of time, and focussing only on artistic matters (that is, without the pressure of having to produce results for an impending presentation), the performers developed a common group sense (enhanced, as mentioned above, by the common ground of their compositional activities). This allowed them not only to prepare materials and reaction techniques that imparted a group identity to the result, but also to develop a common ear between themselves as group musicians — from that point on it became very easy for each member to identify any sound with its creator, independent of visual contact or audible differences between the instruments (in fact, even when similar electronic sounds were being used by all members this was possible). These two factors were very important for the group to produce a cohesive sound and clearly cut formal processes, as well as to enable each player to be in a familiar and comfortable situation, where he could concentrate on his own performance without losing perspective of the whole phenomenon — thus achieving freedom through restraint. As stated previously, each Endphase is a unique event/piece and is never repeated anywhere else. Right from the beginning, our objective was not to have a repertoire of actions-reactions ready to present as many times as possible, but rather to work intensively on individual projects, so that each presentation would have its own identity (without implying that common acoustic and/or formal points between presentations don’t exist). To achieve this goal, it is important that each performance be prepared according to roughly the same protocol — this protocol not being a conceptual abstraction, but rather the result of the context necessary to prepare our work. After the first performance, where we presented the project only when we felt that a good enough standard had been reached, Endphase followed a more common approach: performance dates were set up, and the work was done in order to fulfil them. The first step in preparing for a concert was usually taken up to one month before each event: discussion of concepts, formal ideas, and listing of materials to develop. The discussion is never focussed mainly on one or another of these dimensions or according to a preset hierarchy, but from all three simultaneously, depending on the inclination (or inspiration) of each performer. Suggestions are taken up, worked out, discarded if necessary, until we have a clear proposition of the formal plan for the whole performance, including a concrete idea of the base materials that will be worked on. For this, it is important to know in advance what the concrete conditions for the presentation will be: where the concert will be played, duration, technical conditions of the room (how many speakers, with or without image), what kind of audience is expected… None of these aspects are ignored or left to the last minute, they are always integrated into the discussion from the very beginning. As soon as the main goals of each project are sketched out in as much detail as possible, we start to design the tools to achieve them (much in a similar way as for a written composition). As stated above, each performer does this privately, programming independently from the others. The objective here is not only to produce the components and events of the piece that have been planned out, but also to program the private environment in such a manner that he may reproduce as many sounds as necessary to the piece in the most comfortable way for him. Looking back at the way the performances have developed so far, it is possible to separate the technologies used into several categories: instrument control, spatialisation, networking and video. This is the choice of interface and its control methods. As the software we used was always either Max/MSP or Pure Data, the base of operations has remained quite stable throughout the entire course of the project. The first three performances used acoustic instruments not only as primary sound sources, but also as control sources. By coupling analysis (mainly pitch and amplitude tracking) with synthesis parameters, it was possible to achieve a greater number of possibilities than with sound transformation alone. From the fourth Endphase onwards, there was a general tendency to abandon the use of acoustic instruments in favour of purely digital synthesis and control methods (with the exception of contact microphones, and occasionally, hacked radios). Video example 1 [1:03]. Excerpt of Endphase 12 with the use of pen tablets. Theaterkapelle Berlin, 19 September 2007. Regarding patch control methods, different instruments were tried out: midi faders, midi keyboards, joysticks and foot controllers. The use of any of these devices makes a certain number of controlable parameters available to the performer, and their gestural possibilities also greatly influences the output. An important step was taken with the twelfth performance, where the use of pen tablets (Kreidler and Pais) was introduced. These are very appropriate to the performative aspects of digital interfaces, as this instrument fits “naturally” into one’s hand and body, enabling the control of a great number of parameters (x and y axis, pressure, inclination, tilt and buttons) in a very considerable resolution, and capturing (to be interpreted at a later stage) all possible nuances of the corporeal dimension of performance (Video ex. 1). As already stated, the programming style is very individual and is developed to best suit the needs of each individual performer. Having seen the programming in the initial stages of the project, a look at the patches used for Endphase 13 reveals how each member developed in his own direction — each patch has its own solutions in terms of how to display (or not display) technical information about the synthesis parameters necessary for the performance (Figs. 3a-c). Spatialization is interpreted by us as an open array into which sound material can be distributed, yet intimately connected with the conceptual and formal objectives of each performance. The number of sources has varied from 1 to 8, either symmetrically distributed in the room (stereo, quadro or octagonal setups), or unevenly (Endphase 7–10). Also some unorthodox sources were used, such as hacked or altered speakers in Endphase 10. An approach introduced in Endphase 2 is to relate a type of material with a spatial vector in the room (front—back, NW—SE, etc.) so that a dynamic space is created, but which retains a stable identity (and isn’t treated as an indiscriminate canvas, where “anything goes”). Audio example 4. Beginning of Endphase 2 (stereo reduction). Bartok-Festival, Szombathely (Hungary), 20 July 2004. Other approaches have included the radical separation of the performers’s individual sound sources in the room (one loudspeaker per performer), the automatisation of a spatial gesture encompassing all sources (such as a stable rotation around the audience, or the random permutation between speakers), or the re-creation of a reality-like spatial movement, usually related to what we call “Fluxus Moments” (to be discussed later). About the technical setup of the trio, since Endphase 2 roughly the same approach has been used. All three musicians send their outputs to a single main audio interface, and through the OSC network (see below), it is possible for each member to control or automatise his own location in the room independent of the others. As ultimately there was only one computer distributing all the sound output for the group, it was also possible from Endphase 4 onwards (when acoustical instruments were no longer used) to record the output of the performance directly from the audio card, before it was sent to the room, in as many channels as it was produced — just like the result of a synthesis program, without any loss of quality (Fig. 4). Figure 4. Generic technical setup of Endphase. Although in each performance some changes might happen, this was the core setup of the group in most of the presentations so far. From Endphase 2 onwards we have been using a private LAN network to connect all the computers, using the OSC protocol. This allows for effective real-time control of the spatial parameters we spoke of above, but also makes it possible to send messages to the other performers in case of an emergency. But its main use was to control the formal development of each performance. It was used to trigger messages introducing the next section, to comment in real time on the global result, and even in some cases to sketch out common gestures very precisely (i.e. tuttis) that would be impossible to do without some form of external coordination. In the most extreme cases, it even allowed us to control the timing and duration of the entire performance to the second. Figure 5. Screenshot of the OSC module as seen by Pais with a second counter on the left side and display of messages from the other members on the right. In Endphase 6 and 12 video projection was used, with the output signal generated by using Jitter. Most of the video source content consisted of excerpts filmed by Endphase members, and the images were usually connected in some way with the performance location. In Endphase 12, a collage of several excerpts from classic commercial films was also used. While in Endphase 12 the entire video was fixed and played back in its entirety according to the formal concept of the piece (thus defining the duration of the performance itself), in Endphase 6, all players had access to and could control the playback of the video source through OSC, so that it could be improvised simultaneously with the audio. This allowed each performer to switch roles at any point in the performance between that of a sound or video generator. Video example 2 [1:34]. An excerpt from Endphase 6 with active video improvisation. MensaBar, University of Freiburg, 20 July 2005. This period starts usually one to two weeks before the presentation, during which we meet each day, or when necessary several times a day. All the formal, conceptual and acoustical materials are tried out in a “compositional” situation, i.e. by performing them. From a certain point onwards, all rehearsals are recorded (and kept in an archive) so that after almost every tryout a playback and discussion are possible. This is the stage at which all the elements fixed beforehand are put to the test and changes are made — usually this only involves changes of material, but sometimes changes to the form or concept, or, in extreme cases, to the whole structure may be made. By being able to experience the “piece” first as a performer, and afterwards as a listener, it is possible to judge the several dimensions involved in the process: Is the piece interesting to play? Was it well performed? Does the structure of the piece hold on its own? Are the proportions right, do they have to be rebalanced or another layer added? And on another level, is what’s involved in the performance understandable from the outside? Rarely do composers have the opportunity to have their work performed almost in real time. This work process continues until the moment of the final performance — the Endphase — is reached. Depending on many factors, sometimes the piece has already matured by the time of the public performance — if a satisfactory form was established early on in the process, and only fine tuning was required afterwards. Other times, there are still new ingredients being added to the pot the day before the performance. These are the risks inherent to this kind of projects. Audio examples 5a–c. Beginning of Endphase 4: the evolution of a passage during two rehearsals and the public performance. 5a) three days before the performance; 5b) two days before the performance; 5c) the performance in the Kammermusiksaal of the Musikhochschule Freiburg, 8 February 2005. As a critical reaction to concerns we had with collective improvisation projects in which we participated (discussed at various points throughout this article), one of the most significant aspects of improvisation that we had in mind when we founded the project was the control and management of form. As suggested above, one of the main handicaps we find in “classical” collective improvisations is formal vagueness. In classical free improvisation practice, form is usually not taken into consideration for the performance, it “just” arises, falling too frequently into the same formal clichés, for example, simple and unidirectional global contours (long fade-ins or fade-outs, predictable transitions), “grooves”, etc. One of our main goals was to make the development of form a dimension of the performance, allowing amongst other things, sudden changes of situation, unpredictable transitions and other more precise ways to manage the global form. For this, we worked quite intensely on pre-arranged formal ideas — extending from exercises of small dimensions to the planning of entire concerts or series of concerts — and we developed ways to have rapid and precise control of the form during the live performance (as mentioned above, Networking), with the purpose of building formal processes that avoid, or at least surpass, traditional clichés in improvisation. Although there are other characteristics of the project that we could discuss, we wish to to avoid systematizing that which was never systematic in the first place. However, it could be useful at this point to comment on some past performances from the perspective of the characteristics we have just discussed. These examples should also show that it’s not always possible to clearly dissect these characteristics in the finished performance, since they are only parts within the global entity of a specific performance. The beginning of this performance is very significative because of its “Fluxus” character, in which three minutes of mechanical repetitions are performed, breaking with the habitual free and heterogeneous build-up beginnings typical to so many improvisations. A binary form with a Fluxus Moment acting as a fold-over. In the first section we only used samples of Pierre Schaeffer’s Étude aux chemins de fer, playing fragments that were more and more recognizable until we finished the section by just letting one minute of the original fragment to be played back undisturbed in the rear loudspeakers (Audio ex. 6a). After that, the fragment was folded over itself and played backwards before being cut off by a section built with radically different materials played at almost imperceptible dynamics, contrasting with the more active, concrete and sonorous first section (Audio ex. 6b). Audio example 6a and 6b. Endphase 4: 6a) end of the first section; and 6b) the end of the “Fluxus Moment” and the beginning of the last section. Kammermusiksaal of the Musikhochschule Freiburg, 8 February 2005. After having used the space as a front-back division during the whole performance, a non-improvised realistic spatialization of a ping-pong match was played back. This arbitrary connection broke the inner logic of the performance and opened up the possibility of a new discourse, in part using elements from the ping pong section (Audio ex. 7). Audio example 7. Endphase 5, an excerpt surrounding and including the Fluxus Moment. Overtoom 301, Amsterdam, 24 April 2005. Video example 3 [4:03]. Endphase 6, Fluxus section. MensaBar, University of Freiburg, 20 July 2005. In the second part of our first audiovisual performance, we thematized the projection of image itself. We used video recordings of projection screens, monitors, big publicity screens and even the same screen onto which the performance was projected. As a Fluxus Moment, we recorded a monitor being thrown over a bridge. After this excerpt appeared in the performance, there were 30 seconds of stillness, 30 seconds of black-out, 30 seconds of solo audio and a radically different continuation of the performance (Video ex. 3). This performance took place over the course of an entire day as a presentation in the Intermediae art space in Madrid. It was a hybrid between installation and performance, making a very static situation that was disturbed from time to time during the day by very active performative interventions. During the intermission of Alberto C. Bernal’s graduation concert, sounds of the composed pieces performed in the concert and live sounds of people talking during the intermission were played back at very low levels as a kind of “amplification” of the sound memory after having heard a concert, of the sounds that remain in one’s ears after an intense hearing (Audio ex. 8). Audio example 8. Excerpt from Endphase 9. Kammermusiksaal of the Musikhochschule Freiburg, 8 February 2006. 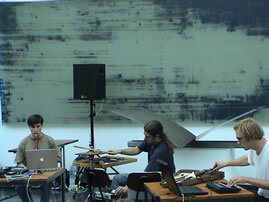 As with Endphase 6, this performance was in the cantina of the University of Freiburg. The second part of the concert began with several minutes of C major chords extracted from recordings of piano music from the Classical repertoire (Audio ex. 9) and suddenly continued with restaurant sounds: dishes, forks, boiling eggs, water poured into a glass, frying oil… A Fluxus Moment consisted of an improvisation with the sounds of popcorn being cooked live (literally) on an electric cooking element sitting near us during the performance. This part was structured by means of an exponential increase of quasi-individual sections: 10, 20, 40, 80, 160, 240 and 480 seconds. This macroformal idea was the main cohesive element of this part, with the specific material within each section being almost independent from the other sections. Audio example 9. Endphase 10, beginning with C major sequence. MensaBar, University of Freiburg, 15 May 2006. As part of a series of summer concerts, this performance took place in a large indoor swimming hall, which had been drained of the water it holds over the Fall-Winter season. We played at the edge of the pool, and after having improvised a quasi-spectral texture for several minutes with radically non-semantic or neutral sine tones, we introduced a Fluxus Moment in which — analogous to Endphase 5 — the discourse was radically broken. This time it was through the re-creation of a diving competition (including the announcements of the jury’s score marks), the sound of which was “realistically” diffused in the vertical dimension of the octophonic space we used for the concert. Here the Fluxus Moment itself commented in a fairly ironic — as well as humourous — manner on the performance context (Audio ex. 10). Audio example 10. Endphase 11, beginning of the diving competition sequence. Faulerbad Freiburg, 30 July 2006. Video example 4 [2:55]. Endphase 12, smoking woman, before and after. Theaterkapelle Berlin, 19 September 2007. This was an audiovisual performance that took place in the Theaterkappelle, a converted church in Berlin nowadays used for cultural events. In one of the two sets we used a simulated live video recording of the environment around the church, namely the traffic on the street outside, filmed at around the same time of day as the performance would occur. The everyday activities occuring on the street — passing cars and tramways — was the trigger of the audio actions we performed upon it, a kind of soundtrack created live as a reaction to the reality outside the performance hall. This realistic and in a way unexpressive discourse was broken down by means of the sudden appearance of a video fragment of a smoking woman enjoying herself, accompanied by the idyllic soundtrack of Wagner’s Rheingold Prelude, treated electronically with an exaggerated church-like reverberation. That sequence was followed by a kind of explosion in form of many visual particles (still images) of the inside and outside of the church (Video ex. 4). These were coupled with different preset sounds, creating a kind of mosaic-like portrait of the church with our own audio layer. In December 2007, Endphase did a Portuguese tour with three concerts, comprising a total of five performances of the same piece. To prepare the form of a piece that — for the first time — we would play more than once, we used different permutations of six sections, combined in a different sequences and durations. Also, each complete piece had only five sections in total, so that in each performance one of the prepared sections would be missing. This is an example of the aforementioned extension of formal ideas to macroformal dimensions that exceed the boundaries of the individual performance. Having discussed our technical and æsthetic concerns, we should look at some practical aspects of the group’s current situation. During the first few years of the project we were all studying at the same institution in Freiburg, which meant, on the one hand, that it was very easy for the group to meet and, on the other hand, we had regular (and cost-free) access to both rehearsal and performance spaces and to a range of equipment. However, in 2006 Kreidler and Pais moved to Berlin, and Bernal to Madrid, and the geographic separation obviously made it difficult to work together, as projects had to be planned far in advance in order for everyone to be able to set aside a block of time for travel and rehearsals, and to organize an appropriate rehearsal space. Figure 6. Enrique Tomás performing. The situation changed again in early 2008, after Endphase 13, when Kreidler decided to leave the group. Soon after, the Spanish sound artist and Ars Electronica collaborator Enrique Tomás joined Endphase. Tomás is a musician with one foot in the classical/contemporary tradition (he also studied composition) and another one in the underground electronic music, sound art and art intervention scenes. Already in the first stages of this renewed formation, the project underwent some transformations, in order to accommodate the new input and the unexpected æsthetic situation that this new combination produced. Although we have already performed with the new formation a couple of times, the group is still in the phase of readapting itself, so that the skills and background of all members can be fully exploited in the preparation of the next projects. This implies that we must, in a sense, undergo the same sort of process as in the first stage of Endphase, which established the common ground for the performances that followed. An “unplugged laptop performance” with the sound coming only directly from laptops, stimulating a quest for different types of material and expression suited to the qualities of the medium. Although this review was mainly focused on the trajectory of the project from 2003 until the present, during which time a stable identity and working method were gradually developed, Endphase is — more than ever — a relevant project that continues to question and develop its identity and its relationship with the status quo of the (classical) new music and performance art / improvisation genres. In order to achieve this balance, we believe that our role as composers of written music who have developed other interests in regards to performance is vital in the realization of the necessities emerging from our individual desires to influence the reality around us. As such, we not only reflect abstractly upon these circumstances, but also — and particularly — act directly upon them from an active and constructively reflected position. Our main desire for the future is that, in parallel to our individual growth as composers, Endphase continues to tackle new influences and challenges, so that its creative energy continues to grow on fertile ground, focussing on both compositional as well as performative aspects relevant to our present time, thus appealing equally to a broad range of listeners who might be drawn to one or the other side of our æsthetic equilibrium. The original multi-channel recordings of the performances (and rehearsals) mentioned in this article are available upon request. Visit the Endphase website for more information, texts and performance materials. Several video recordings of performances are also available on YouTube. Thanks to jef chippewa / shirling & neueweise for proofreading and corrections to the English version of the article. Alberto C. Bernal (Madrid, 1978) studied piano, music theory and composition, and Jazz in Madrid and Salamanca before moving to Germany to study with mathias spahlinger (composition), and with Mesías Maiguashca and Orm Finnendahl (electronic music) at the Freiburg Musikhochschule Freiburg, where he was also an assistant in the electronic music studios. He later completed his education at the electronic music studios of the TU Berlin and with lessons with the composer Peter Ablinger. In 2007 he was Composer-in-residence at the Reina Sofía Museum in Madrid. Bernal is also very active in other related music fields such as sound art and performance, mainly within the context of the Endphase project. Deeply interested in the æsthetics of New Music, he regularly publishes articles in various media and also gives lectures and courses in different institutions and cities. In 2008–09 he is a laureate of the Madrid Council in the Residencia de Estudiantes. João Pais (Lisbon, 1976) began his musical studies with piano and violin. He studied composition starting in 1993 with Evgueni Zoudilkine, and continued at the Lisbon Music Academy under Christopher Bochmann and António Pinho Vargas from 1996–2000. In 1998, he studied at the Royal College of Music with Jeremy Dale Roberts, and from 2002–05 he studied at the Musikhochschule Freiburg (Germany) with mathias spahlinger (composition), and Mesias Maiguaschca and Orm Finnendahl (electroacoustics). From 2003–05 he was a tutor in the electronic music studio in the Musikhochschule Freiburg. Pais has participated in courses and seminars in Lisbon (Emmanuel Nunes), Paris-IRCAM (Salvatore Sciarrino), and Darmstadt (Germany). Between 1997–2001, with colleagues Diana Ferreira and Luís Antunes Pena, Pais founded and directed the Jornadas Nova Música in Aveiro, Portugal, a festival dedicated to new music. With Alberto C. Bernal and Johannes Kreidler / Enrique Tomás, Pais plays in the electronic improvisation trio Endphase. He currently lives and works in Berlin. Musically trained since he was four, Johannes Kreidler (Esslingen, 1980) had his first piano lessons at the age of eight. In 1989 he began composing, and in 1990 he started taking lessons in composition and music theory at the Musikhochschule Stuttgart. Additionally, he began playing the violin and organ. From 2000–06 he studied at the Musikhochschule Freiburg with Mathias Spahlinger (composition) and with Mesias Maiguashca and Orm Finnendahl (electronic music), studying philosophy in parallel at the Universität Freiburg. From 2004–05, he studied electronic music at the Institute for Sonology at the Royal Conservatory in The Hague (Holland), from which he received a European Community scholarship. He has taken courses with Helmut Lachenmann, Brian Ferneyhough and Richard Barrett. He has been teaching at the Rostock University of Music and Theater (music theory and electronic music) since 2006, and at the Hochbegabtenzentrum, Detmold University of Music since 2007. Currently, Kreidler lives in Berlin. 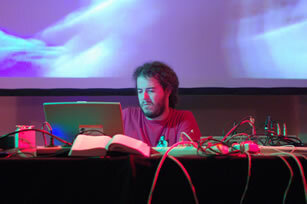 Enrique Tomás (Madrid, 1981) is a telecommunications engineer and an interactive music systems composer. A dissident of the academic composition academy, he was responsible for sound art works like the interactive installation Algorithmic Echolocation, exhibited at SONAR 05 Festival, Ars Electronica 2005 and Observatori 2006. As an educator and developer, he has given workshops and master classes on interactive art installations, gesture control and computer music at different institutions and festivals in Europe and America. He is member of various free software and experimental music art collectives (EMI, RecursiveDog, Atmosfera::Sustrato_Ruido, Endphase), where he is active as a performer and artist. He has worked for MedialabMadrid and Medialab-Prado (2005–07) as a technical assistant in the design and production of interactive art installations, and in the UC3M Robotics Lab. Since August 2008 he is based in Linz where he works for Futurelab Ars Electronica.